This product is available for immediate .pdf download. You must have Adobe Acrobat® Reader® installed to view this e-product. The Sales profession is unlike other professions, such as medicine, law or even insurance or real estate, in that there are no standardized examinations required to become licensed. There is no formal Code of Ethics or governmental agencies that enforce standards within our profession. There are no established standards of performance at all. As a result, it is easy for sales professionals to become complacent in executing our processes and in pursuing our professional goals. It is way too easy for us to lose sight of those practices and procedures that produce results. Invariably, this leads to performance very much below our individual capabilities, sales that are clearly not representative of potentials in our territories, earnings below our personal potentials, and career plateaus that can stifle even the greatest potential. 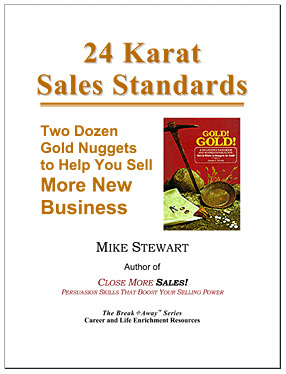 This E-Book offers specific exercises that lead you to develop 24 critical-to-success sales development techniques that will add significantly to your skill set. Earn what you are worth. 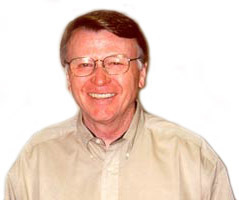 Mike Stewart is a Certified Speaking Professional and Registered Corporate Coach. Our Associates are highly qualified, as well. Job Satisfaction and Your Life! ©1999-2013 Stewart & Stewart Inc. All Rights Reserved.